This Side of Providence, by Rachel W. Harper (Prospect Park Books, March): Why oh why did more people not talk about this book? Read this book? Love this book? Harper's novel focuses on a picks apart the ways racism, poverty and addiction impact one family. It's raw and honest and heartbreaking and really excellently done. (Full review in Shelf Awareness for Readers). Shelter, by Jung Yun (Picador, March): Shelter takes the story of a dysfunctional family one step beyond "normal" dysfunction, and then two steps beyond that. I read the entire novel in one plane ride, unable to look away once I started it. The Girls, by Emma Cline (Random House, June): Cline's novel is ostensibly about a 1960s teenager who is drawn into a cult. But what makes The Girls so incredible, so astounding, is not its fascinating story of a unique teenager in a unique situation in a unique time, but the ways in which Cline's fictional protagonist resonated so much with me--who was never alive in the 60s, never joined a cult, and never expected to find myself on the pages of a cult novel. The Mothers, by Brit Bennet (Riverhead, October): Bennet's debut has been widely praised, and for good reason. It's everything I look for in a novel: well-plotted, complex characters, gorgeous sentences, and thoughtful points I chewed on long past the last page. Later this week, I'll be rounding up the best backlist I read in 2016. 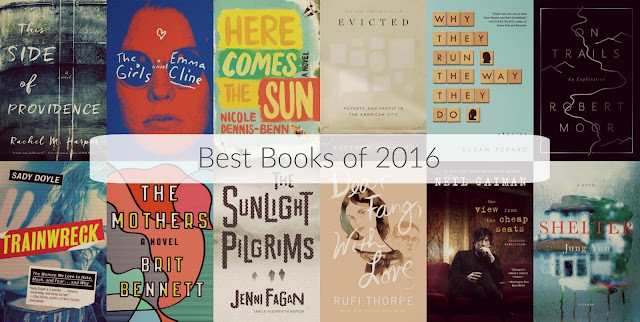 In the meantime, I want to know what your favorite books of the year were. Leave 'em in the comments!